We know that Hasbro likes to release action figures by theme whenever possible. This worked very well for the Build A Droid line since you needed to buy all the figures to construct the pack-in pieces into a new figure. The early waves of 2012 also follow this protocol. Hasbro released 12 figures in wave 10 to coincide with The Phantom Menace 3D in theaters and then wave 11 is based on Return Of The Jedi deleted scenes exclusive to the Blu-ray box set. There are some wonderful characters in this wave. We’re especially thrilled about Lando Calrissian (Sandstorm Outfit) because it’s the only all-new figure in this wave, but we wonder if he should have been released as a “deleted scene” figure instead of the standard Lando Calrissian (Skiff Guard Disguise) figure instead. We’re not saying that the deleted scene accessories shouldn’t have come with him. No, we’re more than ecstatic that they’ve been included here. But just like 2010’s TVC Wicket (VC27) figure, Lando could [should] have been released on a replica card back from 1983 instead with those “extra” pieces tucked in along for the ride. Like we’ve mentioned, there was a blatantly obvious theme running with this wave of The Vintage Collection. But we can’t help ache in our hearts that we were so close to getting a modern vintage Lando Calrissian (Skiff Guard Disguise) figure yet it’s completely out of reach (at least for 2012). Lando Calrissian is actually an artistic triumph. But it does have a few small issues. Nothing is so bad that it would prevent us from buying it, then again, not much of anything prevents us from buying Star Wars figures, but there is one glaring “mistake” that is very obvious. Lando’s skin color is too pale. Billy Dee Williams possesses a moderately medium brown complexion and this action figure is much too light. That being said, the head sculpt is of an incredible quality. It looks similar to 2011’s TVC General Lando Calrissian (VC47) but to the nth degree better. His moustache doesn’t overtake his facial features and the expression in his eyes is just about as accurate as we can recall from Return Of The Jedi. Once you remove the outer plastic head covering, there is a soft-goods poncho which is also obviously removable. And underneath that poncho lies a super-articulated modern update to that blessed 1983 figure. Honestly, some of the paint operations look a tad rushed, but overall we now have a definitive modern update to Lando Calrissian (Skiff Guard Disguise). The removable helmet, skiff guard blaster and force pike are also all included and these accessories are phenomenally sculpted and function wonderfully on Lando’s person, whether in his hands or atop his head. You catch our drift. It’s only when you set him up in the skif guard disguise do you realize just how much you wish he came in the same packaging from the 80s. Such is life we suppose. Lando Calrissian probably has the most complex sandstorm outfit out of all the figures made to date and this even includes Han Solo (BD 1), Luke Skywalker (BD 2) and Chewbacca (BD 3) from 2008’s The Legacy Collection line. (By the way, no one got nearly excited over these figures as they have for the 2012 "sandstorm deleted scenes figures".) The goggles he comes with fit over his head perfectly and we’re inordinately in love with the remote device he come with as well. If you have seen the deleted scene, you clearly remember that red blinking light in Lando’s hand. Well, he comes with that accessory and you’re going to love it too. The soft-goods poncho does look a little too stiff when worn by itself, but the plastic molded outer robes and head covering do remarkable work to shape the soft-goods into a realistic wave with wrinkles and bunching and everything else needs to breathe realism into it. This is such a fun and well made figure it should rank as one of your top favorites of the year. We’ve been waiting since 2004 to get an all-new version of Lando Calrissian in his skiff guard disguise. Now we have a super deluxe version of that with even more accessories that also sourced him to the deleted sandstorm scenes as well. It may be hard for many collectors to refer to this figure as Lando Calrissian (Sandstorm Disguise), but we bet you’ll warm up to it quickly when you realize just how much Hasbro has packed into this figure. Yes, a tweak to the figure’s flesh tones would be significantly more than superfluous (and very appreciated), but this figure should do the “job” for a while. 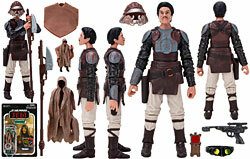 Status: Lando Calrissian (Sandstorm Outfit) is an all-new figure.